Bring a bit of matching magic to your modern bathroom. 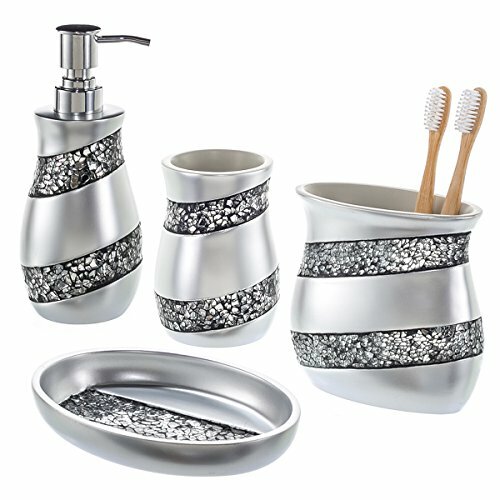 Infuse style and luxury in each of your home's bathrooms with the Bathroom Accessories Set by Creative Scents. Our 4-piece gift set comes ready with all your bath essentials . A truly elegant addition to your vintage or contemporary décor. Stow your electric toothbrush, toothpaste, larger brushes, and other bath accessories in our sizeable toothbrush holder. Meanwhile, a gorgeous soap dish and a pump soap dispenser house your favorite cleansers and lotions. The complementary set also boasts a multipurpose tumbler for rinsing or additional storage. Stay clean, chic, and classy, and give an all-in-one gift for women, men, kids, or anyone with a sophisticated eye. Use your creative scents-and go with the full ensemble! A refined roundup of your essential accessories! Give a holiday or anytime gift that's ready to wrap!